Former Iraqi President Saddam Hussein, hanged for crimes against humanity on Saturday, has been buried in the village where he was born 69 years ago. In a sparsely attended ceremony in Awja, in the Tikrit region north of the capital, the former Iraqi leader was laid to rest in a family plot. His sons Uday and Qusay, killed by US troops in 2003, are also buried there. New video of his execution posted on the internet, shows he exchanged taunts with onlookers from the gallows. Just hours after his execution, Saddam Hussein's body was reportedly flown to Awja aboard a US aircraft and handed to clan leaders for burial. "Saddam Hussein has been buried today at 0400 (0100 GMT) in a place that was constructed during his regime in the centre of Awja," said relative Musa Faraj, quoted by AFP news agency. The BBC's John Simpson in Baghdad says the Iraqi government will not be worried that Saddam's grave may turn into a place of political pilgrimage. Ministers here think that his practical influence in Iraq has been entirely finished by his execution, our correspondent says. The former president was sentenced to death by an Iraqi court on 5 November over the killings of 148 Shias from the town of Dujail in the 1980s. Images of Saddam Hussein being taken to the gallows in a Baghdad building his intelligence services once used for executions were broadcast on state TV on Saturday. Iraqis also saw images of their former leader's body in a white shroud. However the moment of his execution was not shown. The hanging took place just days after he lost an appeal and hours after he was handed over from US custody. Saddam Hussein's execution has closed a dark chapter in Iraq's history, Prime Minister Nouri Maliki said. In a statement, the prime minister said: "Justice, in the name of the people, has carried out the death sentence against the criminal Saddam, who faced his fate like all tyrants, frightened and terrified during a hard day which he did not expect." US President George W Bush hailed the execution as "an important milestone" on the road to building an Iraqi democracy, but warned it would not end the deadly violence there. A small group of Iraqis - including a representative of the prime minister - witnessed the execution at 0600 (0300GMT) on Saturday in a concrete-lined chamber in Khadimiya. Iraqi National Security Adviser Mouwafak al-Rubaie told the BBC the former leader went to the gallows quietly: "He was saying some few slogans. He was very, very, very, broken." However, new images of the execution apparently shot on a mobile phone and aired on some Arab television channels and internet sites, show a more defiant Saddam. Unlike the official Iraqi videotape of his final moments, the new pictures are accompanied by the sound of Saddam Hussein responding to taunts from those present. One of the onlookers is heard telling the former Iraqi leader that he destroyed Iraq and was going straight to hell. 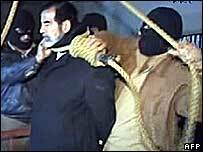 Saddam Hussein appeared to smile at those taunting him from below the gallows. He said they were not showing manhood. He is then heard citing verses from the Koran before the trapdoor opened. As news of Saddam Hussein's demise spread, there were jubilant scenes in the Baghdad Shia stronghold of Sadr City, with people dancing in the streets and sounding their car horns. Similar scenes were witnessed in the Basra and Najaf. But in Tikrit, where a curfew was imposed, the news sparked protests from supporters. Protests were also reported in Samarra and Ramadi. 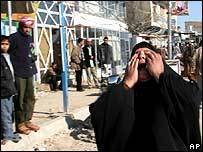 Hours after the execution, at least 31 people died when a car bomb exploded at a market in the southern town of Kufa. Angry crowds killed a man who police said got out of the vehicle shortly before the bomb exploded. Later in the day, at least 37 people died and 76 were injured in at least two blasts in the Hurriya district of Baghdad.